The CH-53K is the Marine Corps' new build, heavy lift replacement for the CH-53E. The US plans to buy 200 King Stallions. The fly-by-wire, triple-engine aircraft is designed with roughly three times the lifting capacity of the Sikorsky CH-53E model that it will replace. The King Stallion will transport Marines, heavy equipment and supplies during ship-to-shore movement in support of amphibious assault and subsequent operations ashore. The Marines are buying 200 aircraft to fill eight active duty squadrons, two reserve squadrons and one fleet reserve group. The CH-53K will be one of the key enablers of future joint war-fighting concepts by drastically expanding the fleet's logistical throughput through the joint area of responsibility. Using proven and matured technologies, the King Stallion is designed to lift a 27,000 pound external load at a mission radius of 110 nautical miles in Navy high/hot environments – three times the CH-53E lift capability. The CH-53K Heavy Lift Replacement (HLR), previously known as the CH-53X Super Stallion, has been the planned follow on to the Marine Corps CH-53E Heavy Lift Helicopter since 2003. 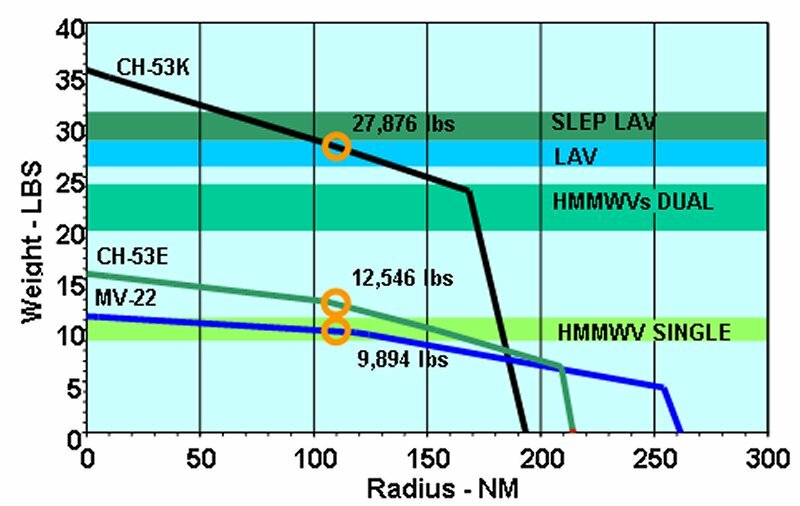 The CH-53K would maintain virtually the same footprint as the existing CH-53E, but would nearly double the payload to 27,000 pounds over 110 nautical miles under "high/hot" ambient conditions. The CH-53K's maximum gross weight would increase to 84,700 pounds versus 73,000 pounds for the CH-53E. One of the more appealing capabilities of the CH-53K would be its performance in mountainous areas in hot day conditions. The CH-53K had been designed to deliver 27,000 pounds out to a distance of 110 nautical miles, to an altitude of 3,000 feet at an ambient temperature of 91.5 degrees F. Additionally, the CH-53K would be capable of carrying a normal load of 32 combat loaded troops, with a maximum capacity of 48 troops. Making maximum use of proven and mature technologies available today, the CH-53K planned to have five times the capability at half of the operational cost of the aircraft it intended to replace. It would be the most capable helicopter ever produced. With more than twice the combat radius of the CH-53E, the CH-53K would use mature technology to deliver a fully shipboard compatible platform to meet current and future Marine Corps requirements. Proven technologies planned for the CH-53K include the Joint Interoperable "glass" cockpit, high-efficiency rotor blades with anhedral tips, low-maintenance elastomeric rotorhead, three larger and more capable 6,000 shp class engines, a cargo rail locking system, an external cargo improvements, a 10,000 hour metal/composite fuselage and survivability enhancements. While heavy lift pilots are sure to like the expanded performance of the new "Big Iron," they are not the only ones the Marines would be building the aircraft for. Given the CH-53E's operational costs and maintenance demands, heavy lift has built a reputation for excellence on the backs of maintainers. The technology incorporated into this aircraft would dramatically reduce the required maintenance at the operator level. 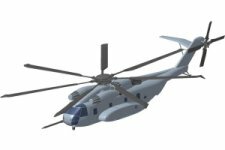 The Sikorsky CH-53K helicopter has been touted as potentially becoming the world's premier heavy lift helicopter. It is a derivative design leveraging the lessons learned from almost half a century of manufacturing and operating the CH53A/D/E models of heavy lift helicopters. Built to thrive in the modern battle space, the CH-53K design was focused on five main areas: internal and external cargo capability, joint information exchange requirements compliance, high reliability, low maintenance, and survivability across the full spectrum of operation conditions. 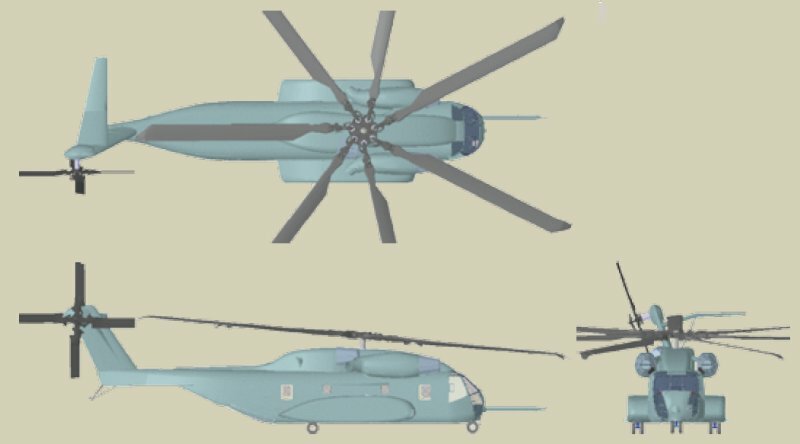 Expeditionary in nature, the CH-53K would be fully shipboard compatible (capable of landing and operating for extended periods on all current and planned CH-53D/E capable ships) and operating from austere and remote forward operating bases. 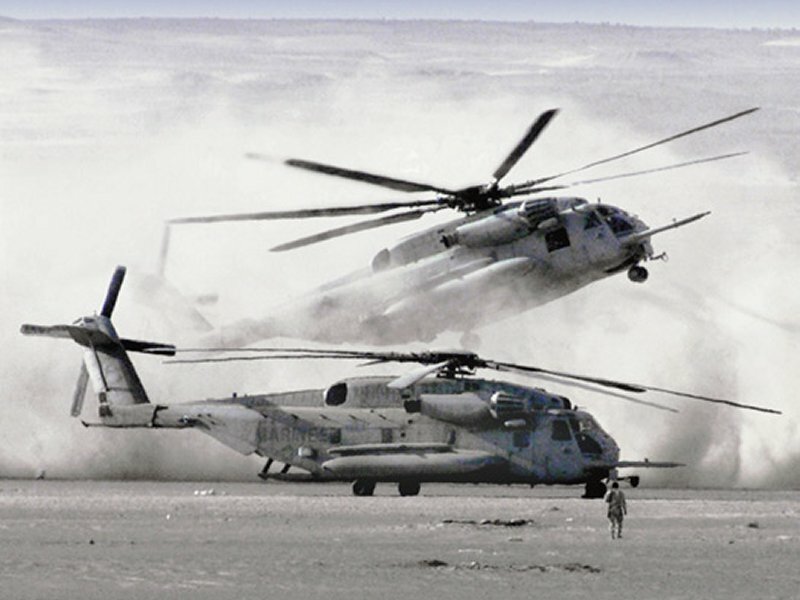 The CH-53K would be slated to become the Marine Corps' critical land and sea based logistics connector which makes Sea Basing Possible. The CH-53K supports the Joint Operations Concept of Full Spectrum Dominance, and Sea Power 21 by being designed to enable rapid, decisive operations and the early termination of conflict by projecting and sustaining forces to distant anti-access, area-denial environments. Expeditionary Maneuver Warfare (EMW) established the basis for the organization, deployment, and employment of the Marine Corps to conduct maneuver warfare and provided the doctrine to make Joint and Multinational operations possible. The EMW operational concepts include Operational Maneuver From the Sea (OMFTS), Forcible Entry Operations, Sustained Operations Ashore (SOA), and Other Expeditionary Operations (OEO). Under the supporting concepts, there would be a continuing need for a heavy-lift capability to support sea-based expeditionary operations. The previous Marine Corps heavy-lift aircraft, the CH-53E (designed in the 1960s and introduced in 1980 as an engineering change proposal to the CH-53D), subsequently developed significant fatigue life, interoperability, maintenance supportability, and performance degradation concerns. In order to support the MAGTF and the JTF in the 21st Century Joint environment, an improved CH-53 was required to maintain the Marine Corps' heavy-lift capability through the year 2025 and beyond. To be practical it was required that the aircraft had to provide improvements in operational capability, interoperability, reliability, and maintainability, while reducing total ownership costs. Although aging and lacking investment over its lifespan, the currently fielded CH-53E continued to prove the relevance and importance of the heavy lift mission in combat and humanitarian relief operations worldwide. 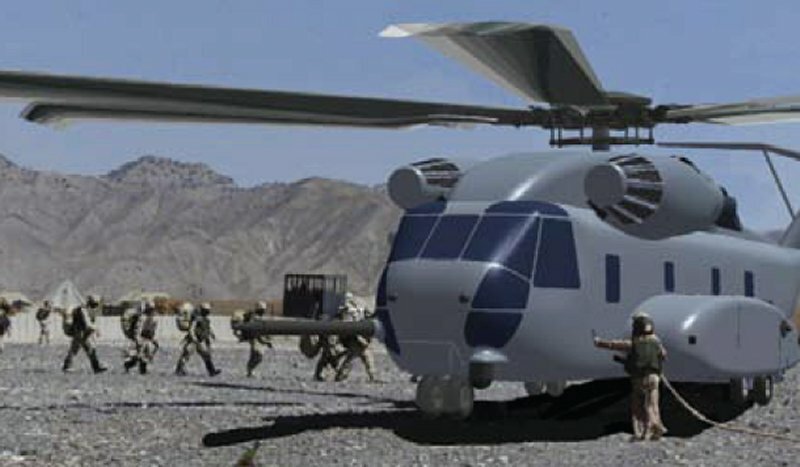 Since the first Gulf War, Marine Corps vertical heavy lift had been getting further and further away from the original requirement it was developed to meet, a behind the lines logistics support aircraft. From the Scott O'Grady rescue mission in the Balkans to delivering critically needed combat support in Afghanistan, Iraq and the Horn of Africa, the Marines were wearing out the aircraft because it has been in incredibly high demand since the mid '90s. The ship-based CH-53E had proven to be extraordinarily relevant to the execution of the national security strategy, Navy and Marine Corps sea-basing concepts and the associated need for capable marinized heavy lift. 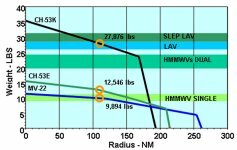 Marinized heavy lift in the past came at a very high price. On average, every hour a CH-53E flies costed the Marine Corps approximately $20,000 and requires 44.1 maintenance man-hours. In the years since the CH-53E had been in service there had not been the investment necessary to effectively address obsolescence, reliability and maintainability issues. 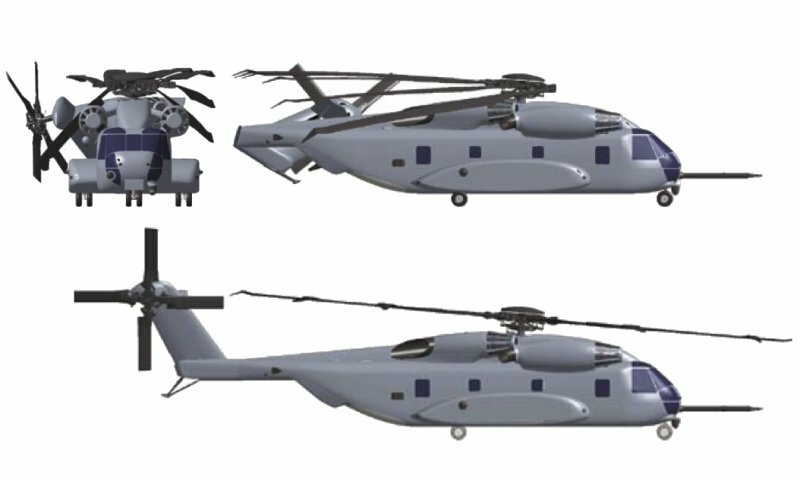 The CH-53E would not meet the heavy lift requirements anticipated in 2015. There was also a significant fatigue life issue looming. A Service Life Assessment Program conducted on the CH-53E determined that the service life was 6,120 flight hours based on the aircraft's transition bulkhead section (location of the tailboom's fold point). Based on predicted usage rates, it was anticipated that the fleet would start reaching this fatigue life limit in FY11 at a rate of up to 15 aircraft per year. Not only was this an expensive fix but it would require significantly increased management attention to ensure there are sufficient numbers of aircraft available to meet operational commitments. 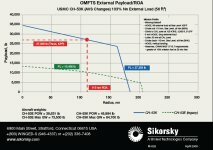 An independent analysis of alternatives conducted in 2003 determined that a new-build aircraft sole-sourced to Sikorsky was the most cost effective approach when compared to either a Service Life Extension Program (SLEP) or remanufactured alternative. Sikorsky was the only known qualified source capable of delivering an operational modernized CH-53 variant by 2015. Sikorsky has been building CH-53's for the Marine Corps since the CH-53A was introduced in 1964. With the extensive history, the analysis concluded that Sikorsky possessed a singularly unique capability to study and define total CH-53 ownership cost reduction initiatives. Since the introduction of the HMWWV, they have been getting heavier. Seabasing CONOPS have also evolved, and MPF(F) ship squadron composition has migrated. All of these factors, and others, affect the lift required for conducting STOM from a sea base. The Naval Postgraduate School (NPS) Operations Analysis Division [OAD] Assault Support Capabilities Analysis, tested mixes of MV-22 and CH-53K for their capability to deliver the required MEU(SOC) and MEB loads from the sea base to landing zones ashore. The expected time to complete the assault was used as the key MOE. Temperature, composition of the landing force, air defense threat, and range were critical factors that were varied. The CH-53K ORD was approved by JROC Memo dated 9 December 2004. The Milestone B Defense Acquisition Board was held on 31 October 2005. The program was approved for entry into MS B System Development and Demonstration and had been designated an ACAT 1D. The new heavy lift helicopter was officially in the pipeline for the Marine Corps following a 22 December 2005 decision by the Honorable. Kenneth R. Krieg, Under Secretary of Defense for Acquisition, Technology and Logistics to authorize the Heavy Lift Replacement (HLR/CH-53K) program and begin a $4.4 billion development program for the aircraft. An Initial System Development and Demonstration contract (worth $8.8 million) to Sikorsky was signed on 3 January 2006. A follow-on ISDD contract was expected several weeks after that. The ISDD contracts were to cover continuing risk reduction efforts and sub-system selection (including cockpit, engines, fuselage, etc), while the SDD contract were to cover most aspects of research, design, test and evaluation efforts performed by Sikorsky for the new helicopter. On April 5, 2006 Sikorsky Aircraft Corporation, Stratford, Connecticut, was awarded a $3,035,000,000 modification to a previously awarded cost-plus-award-fee contract (N00019-06-C-0081) for the System Development and Demonstration (SDD) of the CH-53K aircraft, to include four SDD aircraft, one ground test vehicle, and systems integration, test article production, and test and evaluation activities. Work would be performed in Stratford, Connecticut, and was expected to be completed in December 2015. Contract funds would not expire at the end of the FY15. The Naval Air Systems Command, Patuxent River, Maryland, was the contracting activity. The contract award is part of an overall development program, estimated at $4.2 billion, that would provide the Marine Corps with a fully shipboard-compatible derivative design of the existing CH-53E using mature technology. In 2006 Sikorsky was conducting competitions to select suppliers for the CH-53K major sub-systems, including the avionics management system and the engine. Sub-system supplier selection is scheduled to finish later in 2006. The first CH-53K, a flight test aircraft, was scheduled to make its first flight in FY11. Fleet Marines would start receiving the first of 156 CH-53Ks in 2015. Initial operating capability, or IOC, was scheduled in FY15 and was defined as a detachment of four aircraft, with combat ready crews, logistically prepared to deploy. Once in full-rate production, the aircraft procurement rate was planned to ramp-up to approximately 24 aircraft per year by FY15. The Marine Corps requirement was estimated at 156 aircraft. However, a planned DoN Sea Basing Requirements Study would Subsequently validate the procurement objective. In a March 2007 Government Accountability Office report it was noted that the CH-53K program entered system development in December 2005 without demonstrating that 3 critical technologies had reached full maturity. The program expected one of these technologies to reach full maturity in 2009 and the remaining two technologies to be mature by 2012, three years after the program's design review. While an initial readiness assessment in 2004 for the program identified 10 critical technologies, a subsequent assessment reduced that number to 3. Elements of the 7 eliminated technology areas, including the engines, were not considered critical, although they were decided to still potentially pose challenges to the program as many of them were currently being developed or used by other programs and will be integrated later into the CH-53K. Of the 7 eliminated technologies, 2 are being developed by the CH-53K program and 5 are being developed by or used on other programs and will be integrated onto the CH-53K platform. While the program does not anticipate problems with the 5 technologies, they are dependent on the development and maturity schedules of the other programs. The three critical technologies following the 2004 review for the CH-53K program were the main rotor blade, the main gearbox, and the main rotor viscoelastic lag damper-are not fully mature. The viscoelastic lag damper, which serves to prevent excessive blade lagging, is expected to be fully mature by 2009, while the other two technologies are expected to be fully mature by 2012. The main rotor blade developed is intended to be 6 percent longer than that of the CH-53E and would require improved performance to meet the vertical lift requirement. Current testing of smaller-scale models of the rotor blades was expected to demonstrate increased maturity for the main rotor blade, with the actual sized main rotor blade achieving full maturity by 2012. The main gearbox was not mature as of March 2007. While other helicopters have utilized similar technology for greater loads, they differed from the CH-53K in operational requirements. Tests of the gearbox later in 2007 were expected to demonstrate increased maturity, while full maturity is expected by 2012. A viscoelastic lag damper similar to that planned for use was currently in operation on other helicopters. However, while currently approaching full maturity, it had to be resized for use on the larger CH-53K rotor head and would not reach full maturity until 2009. The viscoelastic lag damper was expected to result in improvements in maintainability and supportability over the hydraulic damper used on the CH-53E. Prototype dampers were being procured and testing of their damping characteristics was scheduled for later in 2007. As had been noted earlier in the program as a likely possibility, attrition of CH-53E aircraft caused an increased need for an operational replacement, resulting in the return of decommissioned CH-53Es to operational status. Supplemental funding was provided to reclaim five aircraft, and funding was requested to reclaim two more while the program continued to review the condition of remaining aircraft. As of 2007, deployed CH-53E aircraft had flown at three times the planned utilization rate. The operational pace was expected to result in higher airframe and component repair costs, including short-term fatigue repairs necessary to minimize CH-53E inventory reductions until CH-53K deliveries reach meaningful levels. To address these challenges, the program intended to manufacture 29 of the 156 total helicopters (19 percent) during low-rate initial production (ILRP) and concurrent with initial operational testing. While concurrent production would potentially help to field the systems sooner, it could also result in greater retrofit costs if unexpected design changes are required. As of March 2008 the program had decided to use an alternative technology for one of the three critical technologies and expected the remaining two technologies to be mature by 2012, three years after the program's design review. Elements of other technology areas were not considered critical, although they had the potential to present challenges to the program as many of them were also being developed or used by other programs and would be integrated later into the CH-53K. Due to attrition in the fleet of CH-53Es, the program had recognized the need for fielding the CH-53Ks as soon as possible. To address these challenges, it planned to manufacture a large portion of aircraft during low rate initial production and concurrent with operational testing. A design review had also been scheduled for March 2009. Due to unexpected attrition of CH-53E aircraft, the need for the deployment of the CH-53K as a replacement increased, resulting in the return of decommissioned CH-53E helicopters to operational status. According to program officials, all available aircraft had been reclaimed while the program continued to review the condition of other usable aircraft for potential spare parts. As of March 2008, deployed CH-53E aircraft had flown at three times the planned utilization rate. This operational pace was expected to result in higher airframe and component repair costs, including short-term fatigue repairs necessary to minimize CH-53E inventory reductions until CH-53K deliveries reached meaningful levels. Program officials stated that to address the challenges that had led to this attrition, the requirements of the CH-53K had expanded the CH-53E's thresholds for heat, distance, and load capacity. The program also intended to manufacture 29 of the 156 total helicopters (19 percent of the planned total) during low-rate initial production and concurrent with initial operational testing. The GAO reported that while concurrent production could help to field the systems sooner, it could also result in greater retrofit costs if unexpected design changes were required. GE Aviation’s all-new T408 engine plays a key role in the increased capability of the CH-53K helicopter. Compared to the CH-53E aircraft’s T64 turboshaft powerplant, the three new engines provide 57 percent more power for approximately 20 percent lower specific fuel consumption. 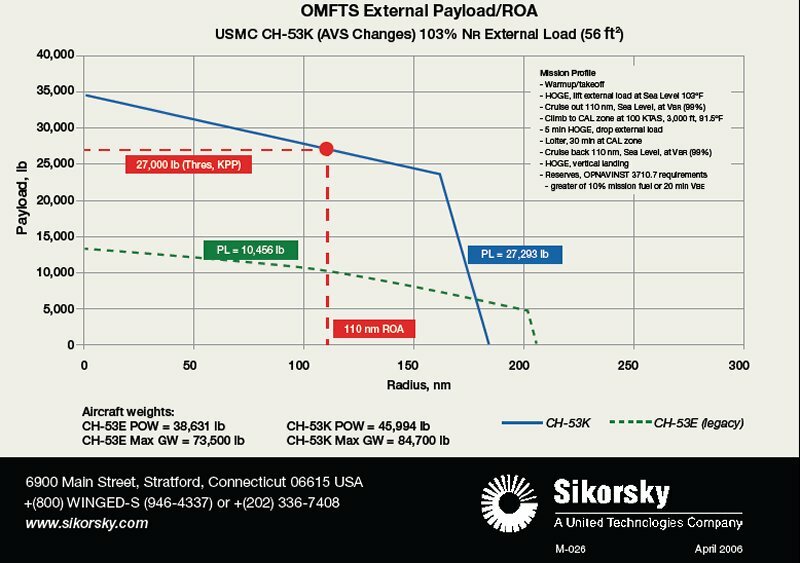 To convert the extra engine power into torque and shaft horsepower within a similarly-sized main gearbox, Sikorsky developed a new transmission that efficiently transfers the engine power to the CH-53K helicopter’s main rotors. For increased lift, Sikorsky developed the largest and most technologically advanced main rotor blade the company has ever produced. At 35 feet span length, and almost three feet chord width, the all-composite blade has 12 percent more surface area than the CH-53E blade. The new aircraft’s major airframe sections were built from strong, lightweight advanced composite materials by Aurora Flight Sciences, Exelis, GKN Aerospace and Spirit Aerosystems. And to ensure exceptional flight handling qualities and low pilot workload, a Rockwell Collins digital glass cockpit governs a fly-by-wire flight control system developed by Sikorsky, UTC Aerospace Systems, Eaton and BAE. To ensure smart, affordable logistics support during the life of the aircraft, Sikorsky and the government are applying methodology that will enable the Marine Corps to analyze flight, maintenance and performance data from every aircraft. By identifying trends across the fleet, the Marines are expected to realize significant improvements in aircraft readiness and reduced operational costs compared to the CH-53E fleet. 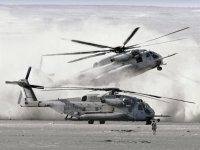 In April 2014, Sikorsky began powered ground tests of the CH-53K aircraft systems, such as rotors, drive, electrical, hydraulic, avionics and flight controls. Hundreds of hours of powered ground tests would prepare the CH-53K team for first flight at the end of 2014, and the start of a three-year flight test program. Per the program of record, at that time the Marine Corps intended to order 200 CH-53K production aircraft and stand up eight operational squadrons and one training squadron to support the Marine Corps’ operational requirements. Eventual production quantities would be determined year-by-year over the life of the program based on funding allocations set by Congress and the US Department of Defense acquisition priorities. By early 2015 the CH-53K program continued to move forward toward production, but hads not yet fully matured its critical technologies or demonstrated that its design can perform as expected. Failures found during qualification testing have led to a number of unexpected redesigns, which have delayed testing and production. While the ground test vehicle had been delivered, and was undergoing tests, problems with qualification of parts delayed delivery of the first few test aircraft as well as initial testing and first flight, thereby adding risk to the program's ability to execute its schedule. The CH-53K program's two critical technologies — which are housed within the main rotor blade and main gearbox — has yet to achieve full maturity nearly 10 years after the program began system development. These technologies have successfully been tested using the program's ground test vehicle and continued to be evaluated when the program began operational flight testing in 2015. Unanticipated design changes to non-critical technology components have caused delays. For example, the CH-53K relies on a number of gear boxes which do not house critical technologies. Several of those gear boxes have suffered setbacks during qualification testing, which has resulted in unanticipated redesigns and schedule delays. In addition, the rear module assembly, which is part of the main gear box, but not associated with the critical technology it houses, required a modest redesign. Testing has also revealed problems with vibration in the drive shaft as well as temperature issues with the top deck engine exhaust. According to the program office, resolutions to these issues have been determined and the necessary redesigns have been made. Program officials reported that the unanticipated number of redesigns has lead to schedule delays and changes to test plans. For example, the program's first test flight, which was already delayed by one year, will be further delayed while the program determines solutions to issues found in qualification testing. Some of these solutions will be temporary, allowing the program to move forward with testing while they simultaneously incorporate a long term solution. In one example, qualification testing of the main gear box rear assembly found that three gears—module output, input idler, and tail take-off—were not working as planned and would require redesigns. In the meantime, a temporary solution has been reached that will allow further testing, but will not allow full envelope testing. The program's ground test vehicle was delivered in October 2012 and is currently undergoing full aircraft systems testing. Initial testing of this aircraft, commonly referred to as "light off," began 11 months later than planned. According to program officials, production of the first engineering demonstration model test aircraft was complete, but the failures in qualification testing revented the program from moving forward with the first test flight. The program is taking steps to address these issues but qualification test failures add risk to the program's ability to execute its schedule. Production of the three remaining engineering test aircraft is ongoing, but had been hampered by the same issues that delayed the first test flight. Qualification failures resulted in instances where fully qualified parts are not available for incorporation onto test aircraft. In these instances, the program has substituted parts that, while qualified as safe for flight, have not yet been fully qualified. These parts will be substituted in the assembly process to enable test aircraft production to continue. As successfully tested, qualified parts become available, they will have to be retrofitted on the test aircraft, which could add further risk to the production and flight test schedule. Lt. Col. Jonathan Morel became the first U.S. Marine to fly the Corps’ CH-53K helicopter Dec. 18, 2015 at Sikorsky Aircraft Corporation's Development Flight Center in West Palm Beach, Florida. Morel, a test pilot with Air Test and Evaluation Squadron 21, and former Weapons and Tactics Instructor with HMH-466 “Wolfpack”, took off in Engineering Development Model 1 at 10:30 a.m. to conduct direct mode mechanical stability and hover flight control response data collection. The flight test ran for 1.5 hours and marked the sixth flight for the CH-53K. 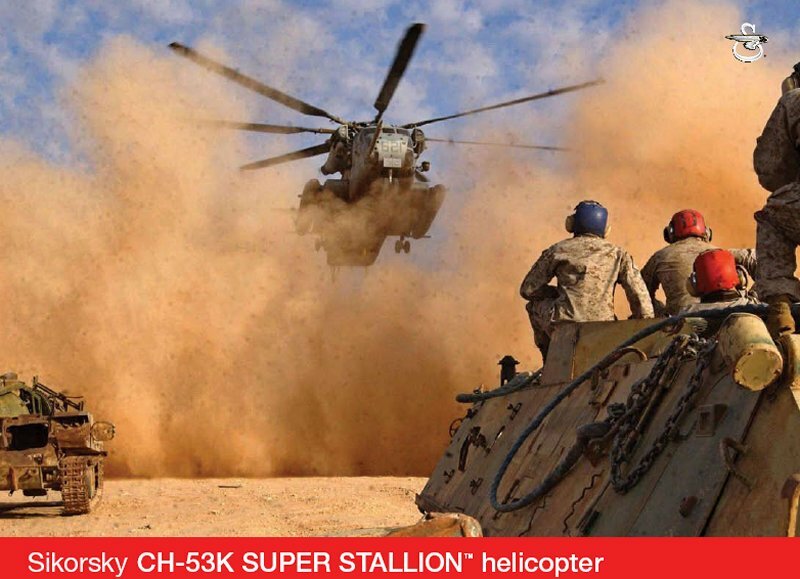 The US Marine Corps wanted the CH-53K King Stallion to carry 13.6 tonne (30,000lb) externally over 110nm (200km) unrefueled, but by May 2016 analysis indicates that it would fall approximately 907kg short of that “objective” key performance requirement. By October 2016 Operational Assessment analyses of the King Stallion performance for a range of required missions demonstrated hovering with a 12,200kg (27,000lb) external load and carrying a 5,422kg load up to 110nm. By March 2017 it was reported that the CH-53K King Stallion unit cost would run about 22 percent above initial projections, with each new CH-53K King Stallion having a unit cost of around $122 million. Representative Niki Tsongas, Democrat from Massachusetts, said during a 10 March 2017 House Armed Services subcommittee hearing : “.. even if there is no additional cost growth, it seems worth pointing out that $122 million per aircraft in 2006 dollars exceeds the current cost of an F-35A aircraft for the Air Force by a significant margin”. Lt. Gen. Gary Thomas stated that the Marine Corps expected the unit cost to fall to below $89 million when the aircraft entered full-rate production, sometime between 2019 and 2022. By 2018 the next-generation heavy lift military helicopter was suffering from more than 1,000 present or forecast "mission-impacting technical issues" that could delay the program up to eight months, Pentagon analysts said in a new program review. A program review found that the technical issues indicate a there's a "high risk" the CH-53K King Stallion helicopter will not be able to meet significant goals on schedule. Choppers participating in a round of flight tests in late 2017 operated at 69 percent performance level, "well below" the 75 to 90 percent "benchmark" needed, Bloomberg reported April 25, citing the program review. The total King Stallion program was estimated near $25 billion in fiscal year 2015, but this figure has climbed to $31 billion, per the Bloomberg report. It would not be unprecedented for this figure to be revised further upward later down the line, either. In March 2017, the US Marine Corps informed Congress that per unit CH-53K costs shot up from $95 million to $122 million. "Even if there is no additional cost growth, it seems worth pointing out that $122 million per aircraft in 2006 dollars exceeds the  cost of an F-35A for the air force by a significant margin," Rep. Niki Tsongas (D-MA) said at a US Congress hearing. Lockheed Martin and the US government's roadmap for the CH-53K had the chopper set to reach the crucial "initial operational capability" status in December 2019, but it appeared that deadline was at significant risk of being pushed back.